When Reese was 4 DAYS old (yes 96 hours out of the womb), we had to pack up our dogs/house/baby gear and evacuate Florida for Hurricane Irma. It was quite the trek lol I wouldn't recommend traveling with a brand new- newborn unless absolutely necessary but we made it work. But it's an entirely different ballgame when you decide to fly the friendly skies! About a month before our trip, I started to panic. I had visions of diaper blowouts at 30,000 feet. Not to mention the social pressure of keeping your baby perfectly still and quiet. There always seems to be ONE stick-in-the-mud who doesn't have an ounce of empathy. But I did feel very prepared - and that went a long way in calming my stress levels and boosting my mama confidence. 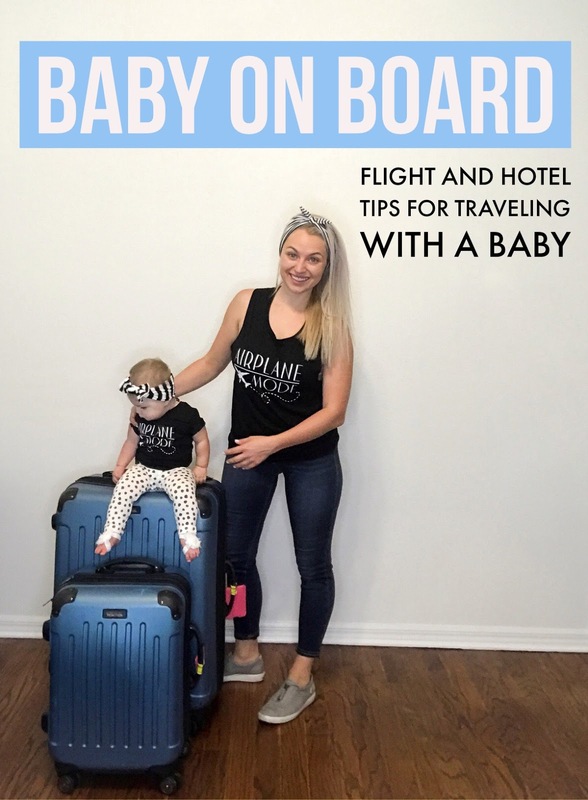 So because so many Pinterest mamas helped me with their articles, I wanted to pay it forward and share some of the most helpful tips and baby gear that worked for us. Depending on your baby's age, you might find these helpful too. Reese was 9 months at the time of travel! If possible, work with your baby's schedule. Our flight options were 7am, 11am and 5pm. 7am would mean waking Reese up super early... 5pm would mean we would land close to bedtime...and still have to make it to the hotel/unpack and somehow help to sleep in a brand new environment. 11am was perfect- early in the day, she was in a great mood and it would cause the least amount of upset to her regular sched. We were lucky enough to have a direct flight which was a huge win! If at all possible, avoid the back of the plane. On a subsequent flight, we somehow ended up in the last row. Lines for the bathroom, flight attendants shutting cabinets (which sounded like slamming) all prevented Reese from being able to sleep. Eek! If at all possible, opt for a AirBnB, Homeaway, VRBO instead of a hotel room. You're more likely to have the convenience of a kitchen! And possibly an additional room where baby can sleep undisturbed. 3) Stroller/Car Sear Combo (Doona!) which we gate-checked. ((Side note: we DID purchase the travel bag to protect it and keep it clean. Well worth! Baby Body Wash - Our fave! Baby Monitor - THE BEST! Also packed/wore our Lillebaby Carrier and her Doona stroller/carseat. I was stressed about this but it honestly was a breeze. Keys to success...I wore Reesey in her baby carrier, slip-on shoes, we only had 1 bottle of formula made (all of the others just had powder and we bought water at the gate). We used the stroller to carry all of the gear and then folded it up and sent it on the belt. Used it again to transport all of our carry-on bags to the gate. My best advice is- arrive early so you don't stress. And don't be afraid to ask for help. Make sure everything you need is easily accessible in the bag you'll have at your feet. We made a mini Diaper Changing kit so it was grab-n-go. We just threw that all in a gallon ziplock and it was SO easy to just grab from the top of her diaper bag. Before we boarded, I put Reese in an overnight diaper so she was wearing something more absorbent. A lot of people will tell you to have the baby eat at takeoff and landing. I wish I could say we had some brilliant plan to make that happen, but truthfully... I think we just got lucky! Reese just happen to be hungry at those times and was happy to have her bottle. She fell asleep pretty quickly and slept for about an hour. I usually can't stand the white noise of the plane, but in the case, it was super helpful. There was an excited 5-year-old sitting behind us who woke Reese up (whomp whomp), but she was easily distracted with toys and games of airplane/tickle monster/peek-a-boo. We simply requested a pack-n-play from the hotel. And asked for a room with a fridge. Hotels will provide a fridge for medical reasons- so if you need one for breastmilk or formula, that usually qualifies. We did bring our Newton mattress cover. I tend to be a bit of a worry wort so you can totally bring a regular crib sheet to bring some smells and comforts of home. At 9 months, the risk of suffocation is greatly reduced but I like having as much peace of mind as I can! This mattress cover us breathable! So even if they smoosh their face into it, they will still get air. We do have the Newton Crib Mattress in her crib, but if you already have a crib...you can simply add the mattress cover to what you already own. Use chip clips to close the gaps in the curtain. This made a big difference for us! And having her noise machine is a must so we can still move around without waking her. We had a good size room that was divided by a desk and a tall partition. We were able to put her on one side so she couldn't quite see us. If the bathroom is large enough and well ventilated, that might be another good option. Depending on how close you are to the elevator, you might hear a lot of noise in your room. Roll up a SLIGHTLY damp towel and stuff it up against the bottom of the door. We didn't bring painters tape but I wished that we had. So many little things with lights from the phone, tv, thermostat....etc... I've heard of people covering them with a bit of tape. We had to improvise with washcloths which helped reduce the light. If your baby is crawling, grab a hotel sheet and lay it on the floor for a nice clean area to play. I know some people are okay with their little one crawling around... but the thought sends shivers up my spine hah So many shoes walk on those floors! Luckily our hotel water got EXTREMELY hot very quickly. We used a tupperware tote filled with hot water and dish soap to wash bottles. I get a little weirded out by washing bottles in the bathroom but it worked. Our hotel did NOT have a tub...and no rooms with one were available. So I'm glad I packed the inflatable tub. Reese really loves her bathtime and it helps her wind down before bed. For you, this might not be necessary at all. This is the TUB we have...$12 and it was great! Random Travel Hack- Depending on where you are staying, do a quick search for the local dollar store. We randomly had one nearby and it was AMAZING. Paper towels, trash bags, handsoap, washclothes... lots of little things that you may need!